Post Summary | Over 30 wildfires are burning across the Northwest in WA and Oregon, while thousands are flocking to one state to view the eclipse. Fire officials will continue to fight fires while those may be near these fire incident locations. We will be posting OREclipse safety tips and other important information to protect you and your family. These will be in separate posts all over our Social Media Channels (Twitter, Facebook and this Blog). Stay tuned for important Public Service Announcements aka PSAs). Here is our recap for Saturday, August 19, 2017. NOTE: Not all wildfires are listed on this map. 20 miles NW of Baker City, OR. Wallowa – Whitman NF. Started 8/4/2017. USDA Forest Service Unknown cause. 499 acres. 98% contained. 3 crews, 5 engines, 2 helicopters. Crews are currently mopping up and gridding is in progress. 20 miles NE of Prineville, OR. USDA Forest Service. Started 8/11/2017. Lightning caused. Timber Brush. Lightning. 125 acres. 65% contained. Threatened are 31 single-family residences (SFR), 33 mixed residential/commercial, 90 minor structures. 83 personnel, 3 crews, 3 engines. Minimal fire behavior. $209,000 cost-to-date. 12 Miles NE of Keller, WA. Started 8/9/2017. Lightning caused. 1,863 acres. 27% contained. Fire behavior is active with backing, isolated torching and short-range spotting. 474 personnel. 10 crews. 3 helicopters. 21 engines. $4.7 Million cost-to-date. Kalmiopsis Wilderness, OR. Started 7/12/2017. Unknown cause. USDA Forest Service. Type 2 IMT with NIMO shadowing. 22,042 acres. 14% contained. Structures threatened: 50 homes, 50 minor. Destroyed structures: 2 homes, 1 minor. Extreme fire behavior that is wind-driven, creeping and smoldering. 65 personnel. 1 crew. 1 helo. 1 engine. Cost-to-date is $2.8 Million. 27 miles NNW of Winthrop, WA. Timber, brush. 30,043 acres. 17% contained. Under threat: 2 homes, 2 minor structures. Active fire behavior with backing, flanking and group torching. 364 personnel. 9 acres. 2 helos. 18 engines. CTD is $5.4 Million. 10 miles West of Othello, WA. Mid-Columbia NWRC. Started 8/12/2017. Brush, grass. 17,470 acres. 95% contained. Minimum fire behavior. 3 personnel. 1 engine. 2 structures destroyed. $397,000 cost-to-date. 25 miles East of Tiller, OR. Started 8/8/2017. Lightning caused. Active fire behavior with flanking, running and creeping. 1,900 acres total. 17% containment. 15 fires included. Threatened 5 homes, 15 minor structures. 493 personnel. 10 crews. 5 helicopters. 23 engines. $4.8 Million cost-to-date. 12 miles NW of Shady Cove, OR. 8/7/2017 start date. Lightning caused. 587 acres. 94% containment. Minimal fire behavior. 122 personnel. 6 crews. 1 helicopter. 4 engines. $3 Million cost-to-date. 25 miles North of Goldendale, WA. Started on 8/12/2017 from an unknown cause & is under investigation. Unknown fire behavior. 234 personnel. 6 crews. 17 engines. CTD is unknown. Fire map on Saturday, 8/19/2017. 9 miles NE of Prospect, OR. Unknown fire date started or time. Moderate fire behavior with smoldering, creeping and single-tree torching. 10,654 acres. 61% containment. Spruce Creek Fire (5,043 acres), Silent Fire (2 acres), Blanket Creek Fire (5,396 acres), Butte Fire (5 acres), Broken Lookout Fire (125 acres), Roundtop Fire (10 acres), Needle Fire (8 acres), Sherwood Fire (65 acres). 941 personnel. 28 crews. 6 helos. 20 engines. $26.3 Million cost-to-date. Eagle Creek Trail System, OR. Started 7/4/2017. Unknown cause. 83 acres. 10% containment. 47 personnel. 1 crew. 2 helicopters. Unknown cost-to-date. 13 miles NW of Cle Elum, WA.. 8/11/2017 start date. Lightning caused. Timber. Moderate fire behavior with flanking, single-tree torching. 548 acres. 0% containment. Threatening 850 homes, 13 mix residential/commercial and 500 minor structures. 276 personnel. 4 crews. 5 helos. 17 engines. Unknown CTD. 10 miles NE of Lowell, OR. 8/10/2017 started. Lightning caused. USDA Forest Service. Active fire behavior with running, group torching and spotting. 3,728 acres. 12% containment. Threatened are 4 homes, 1 minor structures. 624 personnel. 21 crews. 2 helos. 15 engines. 11 water tenders. 1 air attack. 4 injuries. $2.5 Million cost-to-date. 17 miles East of Cave Junction, OR. Started 8/14/2017. Rogue River – Siskiyou NF. Made up of 20 individual fires. Lightning caused. 3,200 total acres. 4% contained. Threatened are 14 single-family homes, 5 minor structures. Active fire behavior with group torching, uphill runs and creeping. $1.4 Million cost-to-date. Burning along 16 Road (South of) and 9 miles West of Sisters, OR. Started 8/11/2017 from an unknown cause. Located in Three Sisters Wilderness and about 1.5 miles SW of Black Crater Lake. 7,814 acres. 0% contained. 652 homes are under threat. Level 3 Evacuations in effect for Eddington, Crossroads, Ramuda and along 16 Road, South of Sisters. Level 1 Evacuations for Tollgate. Extreme fire behavior with running, spotting and crowning. 410 personnel. 10 crews and 11 engines. Cost-to-date is $870,000. Started on private land about 5 miles NE of Quincy, WA. Started 8/16/2017. WA Fire Service. Cause under investigation. 6,255 acres. 85% contained. Tall grass and brush. Unknown fire behavior. Threatened are 50 single family hoes, 25 non-residential commercial structures and 100 minor structures. Damaged are 4 homes, 15 minor structures. Destroyed are 4 homes and 20 minor structures. 122 personnel. 3 helos. 30 engines. Unknown cost-to-date. 7 air miles NE of Simnasho and on the NE Boundary of Warm Springs Indian Reservation, OR. Started 8/8/2017. USDA BIA. Grass, timber, dormant brush. Human caused, under investigation. 66,003 acres. 40% containment. Threatened are 50 homes, 4 multi-residential structures, 3 mixed commercial/residential structures, plus 50 minor structures and 1 non-residential commercial structures. Damaged are 1 home and 3 minor structures. Destroyed are 6 homes plus 4 minor structures. Extreme fire behavior with uphill runs and is a wind-driven fire. Significant Event: fire escaped containment lines on 8/17/2017 and made a big run and with extreme fire activity and an extreme rate of spread. 127 personnel. 4 crews. 5 helos. 24 engines. CTD is $24 Million. 33 miles from Colville, WA. Started 8/11/2017. Lightning caused. USDA Forest Service. 4,000 acres. 68% containment. Moderate fire behavior with backing, creeping and single-tree torching. 3 homes are under threat. 139 personnel. 4 crews. 3 engines. CTD is $5.4 Million. 11 miles West of Cliffdell, WA. Started 8/11/2017. Lightning caused. Timber. USDA Forest Service. ALERT: Highway 410 is closed due to trees over the roadway. Level 3 evacuations for Union Creek. Level 1 evacuations for Goose Prairie, Bumping Lake. 9 wildfires: American Fire (150 acres), Union Creek Trail Fire (20 acres). 1,250 total acres. 4% containment. 110 structures threatened. 201 personnel. 5 crews. 2 helos. 4 engines. Active fire behavior with group torching, backing and spotting. $500,000 cost-to-date. North slope of Pelican Butte, OR. Started 8/10/2017. Lightning caused. USDA Forest Service. 200 homes threatened. 500 acres. 0% containment. Timber, brush. 45 personnel. 1 helicopter. 8 engines. Unknown cost-to-date. 13 miles South of McKenzie Bridge, OR. Started unknown. USDA Forest Service. Started 8/4/2017. Cause unknown. Active fire behavior with backing and single-family homes threatened. 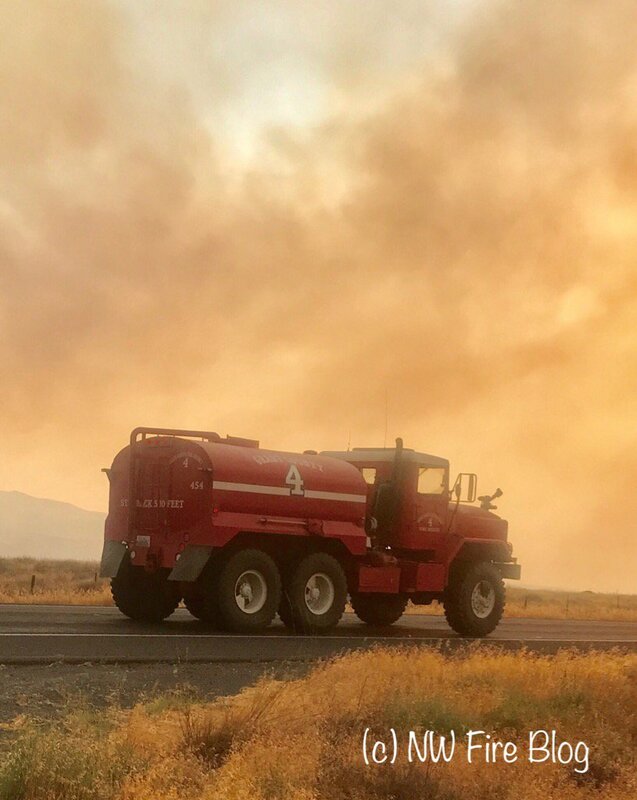 IC also managing other fires Whitewater Fire (6,428 acres), Little Devil Fire (103 acres), Avenue Fire (14 acres), Bob Canyon Fire (27 acres) and French Fire (27 acres). 294 personnel total. 10 crews. 12 engines. $1.8 Million cost-to-date. 10 miles West of Grants Pass, OR. Started 8/10/2017. Lightning. USDA Forest Service. Transitioned to Type 3 IMT as of this morning at 0600 hours. Minimal fire behavior with smoldering and creeping. 156 acres. 85% contained. 180 personnel. 3 crews and 14 engines. $1.7 Million CTD. 23 miles South of Oakridge, OR. Willamette NF. Lightning caused. 761 acres. 0% contained. Moderate fire behavior with group torching, flanking and short-range spotting. Type 2 NW team 9 on order. 233 personnel. 7 crews. 7 engines. $823,000 CTD. 50 miles East of Roseburg, OR. Started 8/11/2017. Cause unknown, under investigation. Active fire behavior with group and single-tree torching. 6,881 total acres. 1% containment. Multiple fires. Happy Dog Fire (1,736 acres), Fall Creek Fire (997 acres), Ragged Ridge Fire (150 acres), Oak Nob Fire (59 acres), Calf – Copeland Fire (260 acres), Broken Tooth Fire (190 acres) and Devils Canyon Fire (140 acres). Threatened structures (36 homes, 21 non-residential commercial and 30 minor structures). Damaged structures (13 non-residential commercial buildings. 686 personnel. 17 crews. 46 engines. 4 helos. $1.8 Million CTD. Umpqua North Complex Fire Alert! Level 1-3 evacuations Douglas County Sheriff Office along Hwy. 138. Red Cross Shelter located at Glide Seventh Day Adventist Church at 19085 N. Umqua Hwy. in Glide, OR. 15 miles East of Detroit, OR. Started 7/23/2017. Lightning ignited. Multiple fires. Timber, brush. USDA Forest. 7,595 acres. 0% contained. Active fire behavior with backing, flanking and single-tree torching. 113 homes, 1 mixed commercial/residential, 2 non-residential/commercial and 46 minor structures threatened. 646 personnel. 16 crews. 8 helos. 13 engines. $15 Million CTD. 10 miles NE of Sisters, OR. Brush and tall grass. Minimal fire behavior. 2,012 acres. 95% contained. Brush and tall grass. 51 personnel. 2 crews and 3 engines. $700,000 CTD.